The Harmony series knows what it is and is quite comfortable in its skin. That might be one of its better qualities overall. The games use a basic, simple-to-understand mechanic to set up increasingly devious puzzles, trying to wind you up more and more. While the games work hard to frustrate you in that respect, the most relaxing, gorgeous music plays in the background, making it nearly impossible not to chill out. This odd discord makes for a compelling combination of flavors, and each installment simply drops another few scoops on your plate. Harmony 3 ($2.99) follows the pattern to a tee, which makes this an awfully short review if you’ve played a game in the series before. Did you like it, and want more? Buy this one, you won’t be disappointed. Did you dislike it or become tired of its bag of tricks? Then you won’t find anything to grab you here. That leaves those of you who aren’t familiar with the series, or perhaps just gluttons for word punishment. Harmony is a puzzle game where your goal is to move pieces around to reconstruct a simple image made up of bands of color. Each piece can only be moved a set number of times, and can only be swapped with a piece in the same row or column. 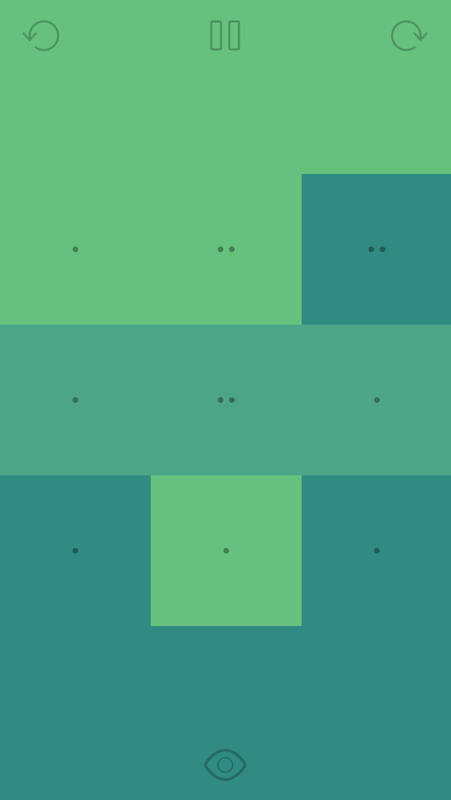 The puzzles start off quite simple, being composed of only a small number of pieces, but the game gradually works itself up to rather complex arrangements with dozens of pieces. This time around, you get 90 puzzles. That may seem like a somewhat small number for veterans of the series, but I imagine this game, like its predecessors, will see more levels as updates at some point. It’s pretty easy to learn how to play, and the size and complexity of later puzzles gives it long-term bite. That being said, there are plenty of puzzle games on iOS, so you might be wondering what gives Harmony its hook. Simply put, it’s the aesthetics. Every part of this game oozes relaxation, from the inviting and soft color palettes to the soothing, atmospheric soundtrack put together by Nashville band Hammock. The soundtrack is more than two hours long, which positively dwarfs most other puzzle games, and although a lot of it will be familiar to players of Harmony 2 ($3.99), there are several new tracks to zone out to. Typically, the longer you play a puzzle game in a single continuous session, the more likely you are to get frustrated. In Harmony, the longer you play, the greater your chances of completing falling into the ambiance. Harmony 3 does present somewhat of a trimmer package than the previous game. The stage count is lower, and the previous game’s sleep mode is nowhere to be found. While it continues the previous game’s goal of having no IAP, you have no recourse if you get stuck on a stage. You can undo up to one move at a time, but the only way the next stage unlocks is if you clear the one you’re on. That makes it a bit more strict than the previous game, and I’m not sure what it gains by it. With much of the soundtrack carrying over from Harmony 2 and the levels numbering in the tens rather than the hundreds, Harmony 3 ends up feeling like one of those good old expansion-pack sequels. There are no new tricks or twists to find here, just more of the same. As such, I think that Harmony 3 is mostly a victory lap for the fans. If you’re new to the series, you’ll get more bang for your buck by picking up Harmony 2, and I’d certainly strongly recommend that you do that, if you haven’t played a Harmony game before. After that, if you’re interested in another set of stages and a slightly different, but equally beautiful soundtrack, you certainly can’t go wrong here.